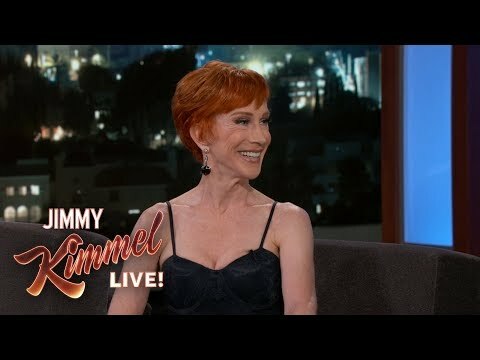 (WATCH VIDEO) Kathy talks about her new friendship with Stormy Daniels, coming back to the comedy world after Trump tried to take her down, and talks about her 98-year-old mother Maggie who is in the audience. >> Jimmy: HOW DID THIS HAPPEN? >> FIRST, I MELT HER. SHE CAME TO SEE ME IN BOSTON. AND YOU KNOW GOD LOVE HER. HAVE BEEN CHATTING ABUT THAT. >> Jimmy: YOU DID, CALLED HER? BACK ON THE POLE, BABY. >> OKAY, FIRST I SET A RECORD. >> NEVER DONE THAT BEFORE? BUT THAT IS A DIFFERENT FIELD. SHE EXCELS IN HER FIELD. >> Jimmy: NOT YOUR CHOSEN FIELD. SHE DOES SO MANY THINGS WITH IT. >> Jimmy: YOU ARE FRIENDS? >> WE ARE HITTING IT OFF. I DO HAVE TO TEASE HER ABOUT. >> OF COURSE WE GET ALONG. SIZES ASKED HER TO PICK ONE. I AM GOING TO TRY NOT TO CRY. THERE, YOU WILL BE OKAY. AND LIKE, HAD MY BACK. OF COURSE, I LOVE YOU. >> Jimmy: I'M GLAD YOU ARE BACK. MY MOM THREW ME UNDER THE BUS. THIS IS, THIS IS THE LIMIT. >> SHE DOESN'T HEAR ME AT ALL. >> IT'S NOT ABOUT YOU FOR ONCE. PROFESSIONAL I CAN GIVE THIS TO.